This is one of those situations where a software company can’t win. People complain about the way it works, so you change the program to fix the problem. Then, other people complain about the fix, and wish it worked the old way. Fortunately, Intuit made this an option so you can have it either way. The issue? Being able to make a change to an invoice and print it without saving the change. An employee creates a bogus invoice and prints it, but doesn’t record it. Hand the invoice to a customer, who pays in cash. Employee pockets the payment and the company never has a record. Of course, there are SEVERAL problems here (accepting cash like this? ), but there are businesses that run this way. An employee creates a valid invoice and saves it. Then some changes are made, to either add services or change the rate. The customer pays the altered amount and the employee pockets the difference. I actually came across this when working with a subcontractor for a homeowner’s association who was doing more work than the HOA authorized. Log in to QuickBooks as the Admin user. Select Edit then Preferences and select the General preference. 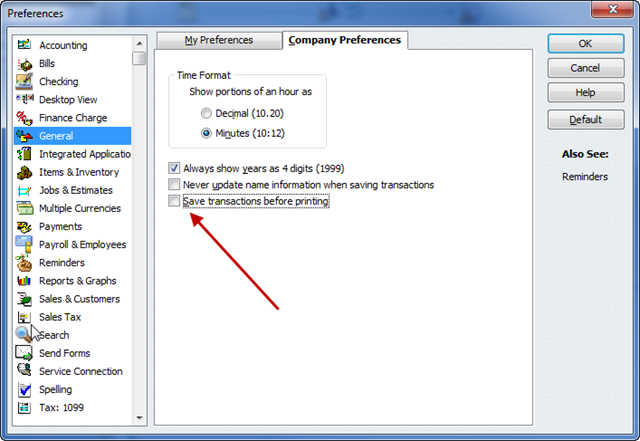 Select the Company Preferences tab, and un-check the box Save transactions before printing. QuickBooks will warn you that this isn’t secure, but it will let you make the change. 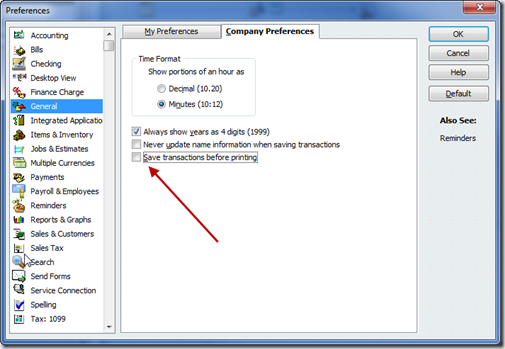 Charlie – I must admit that I have not checked-out this preference change because I have no interest in being able to change an Invoice and print it without saving the changes. I was under the impression that the inability to change forms and print them without saving the forms was intended to provide a security protection against fraud. To that extent if the change is not written to the database, simply held in ‘cache’ while being printed, I am doubting that the ‘Audit log’ is recording the change either, have YOU checked that out? Unfortunately I am not where I can check that out, but I certainly believe that if my ‘doubts’ are realiies, then this represents a serious compromise to the value of the ‘Audit log’ and fraud protections in general. Kind of makes you wonder ‘just who’ would be complaining about the inability to make such changes…..’could it possibly be the “hand that is robbing the craddle” (oops I’m bad….another variance on an old faithful saying). I would definitely use this option. For some reason when I bill only part of a sales order, QB leaves big gaps on the invoice where the unshipped items are. I have to manually go into the invoice and delete the non-billed items and any blank lines. I need to be able to delete these lines and then do a print preview to make sure my line up is ok on the invoice. I would be able to tweak it as needed and then save and print when I am ready. Make sense? I have never been able to figure out how to change this problem! Bill, this absolutely opens the door to fraud, as I pointed out. Fortunately, it is something that can be controlled by the Admin user in preferences. I never recommend that people enable this feature. And, yes, since you can create and print an invoice without saving it first, and then you can clear it, the invoice never appears in the audit trail. But, there ARE people who ask for this ability. David: You can’t do that in QuickBooks. Invoices don’t have the “cost” of the item stored with them. You can use a third party tool like QQube to get that info, though. The latest version lets you create a report that associates the cost of the item with the sale of the item. See my review article at http://www.sleeter.com/blog/?p=480 for info on the product. David – I am not really sure why you would want ‘cost’ and ‘markup’ and ‘profit’ to show on an Invoice which is designed to be sent to a Customer. You can show cost and markup and profit on an Estimate form, print that form, and then attach it to an Invoice (using the Invoice from Estimate form). As a trial, I attempted to ‘duplicate’ a Invoice from Estimate template as a Invoice template but QuickBooks removes those Estimate columns from the Invoice (duplicate) and you can not add them back. I guess if you insisted, you could add a ‘custom field’ for cost to your Items, and then add that ‘custom field’ to an Invoice form, but that seems like a lot of duplicative work. Especially since the ‘custom field’ cost would be a ‘static’ amount and not be reflective of QuickBooks average cost without constantly changing the custom field. Bill, I often see requests for that kind of thing, but it is to be a template for a form printed for in house use, not to give to the customer. Estimates don’t always work because they may not capture the information that applies to the specific invoice. You want the COGS value that goes with the specific sale. The info can be obtained, but it is complicated and requires some manual correlation of different reports. That, however, is why QQube (the most recent update) is so great for this, as it provides that kind of reporting very simply. Estimates vs invoices work well for showing more detail. At my company we always create estimates and bill from those. We grew tired of manipulating Quickbooks templates and struggling with showing and hiding details to clients. I own a Audiovisual company and our clients require a lot of details and groupings on estimates. We use DoEstimate web based software for QuickBooks estimates. It lets you quickly design reports that can show or hide any detail that you want. Since it directly works with desktop Quickbooks it works seemlessly. Thank you for this explanation and I am glad to hear there is an option for this. I do have an additional question. My QB Premier 2010 asks to save an invoice before printing even if I did not modify it in any way. Just open and old invoice and want to print. If the invoices was changed I definitely would want it saved before printing. However, saving when nothing has changes just wastes time. It also asks to save the invoice again on close after it was printed – again nothing was changed. Shouldn’t QB be able to tell the difference whether changes were made or not? Inna – I don’t know why your invoice is asking to be saved before printing, however the reason your invoice is asking to be saved after printing is because upon printing the checkbox for “to be printed” becomes unchecked indicating the invoice has already been printed. Interesting post, I did not even know this was an option. I am not sure why people would even ask for this option unless they were up to something sinister? Definitely opens the door to possible fraud. We use invoices to request retainers. We print that version to a pdf. Then we delete the lines involving the retainer. Printing to pdf before saving speeds up this process, but could be dangerous if you have employees doing this. We do not want the retainer to be on the final invoice to avoid duplication when the work is done and invoiced. Is there an easier / better way to show the retainer information to the client, but not record it as income or affect QB? Thanks in advance. Guy, I can’t think of a simple way to do that, other than to just enter the information as a “comment” in the description column, by itself. We have VERY complex monthly invoices with literally hundreds of transactions and it takes about a week to do each invoice. We have to group charges in a particular way, which is not easy to do in Quickbooks since it doesn’t acknowledge that visual presentation matters and does not allow for post-import rearrangement of line items. Thus it is simply inevitable that mistakes will be made during the process. Being able to print out the invoice and see how it looks (different in the printout than onscreen) saves me having to manually un-bill every one of hundreds of transactions if I have made a mistake in arrangement. Hi! Thanks for providing such helpful information–I just used it to copy and edit an already-designed invoice with my logo. There is another thing I could use your help on–and I so hope you have the answer. While I had no problem setting up the desired fonts for my actual invoices, starting about six months ago the font for the Outlook e-mail that is generated when I click Send from QuickBooks Pro is an ugly machine font and there is no edit capability at all. I like to use Arial 12 for its easy readability and it’s my standard font, but I cannot find a way to change what font is used in the e-mail cover letter generated to go with the invoice. In addition, there is ALWAYS an extra space before the colon in the salutation part of the e-mail cover letter–and as I’m in marketing and am an editor–I can’t send it out that way as that’s the kind of thing I catch for my clients. I manually can change it, but it would be better if it just showed up correctly–and I find no way to remove it as it isn’t in the format within QB. I so hope you can help. Thank you! We hate quickbooks in our office, the boss threw out a perfectly capable system to make way for this mess of stupidity that is quickbooks. Legitimate reason for this functionality? We have several printers that print on various sizes of paper. Our invoice printer does something like 8×5.5 triplicate on tractor feed. These forms simply will not fax, the color of the paper combined with the faintness of the carbon copy result in illegible gray faxes. An alternate form was created to print to letter size on our laser printer. This however is to large a format for our day-to-day operations and lacks multiple copies. When a year is closed, it is pasword protected by the external accountant to prevent changes. Occasionally we need to re-fax invoices for payment from the end of the previous year, requiring us to change the old invoice to use the other form for printing. This results in quickbooks asking for the password to unlock that year for changes, something that for some reason cannot be allowed. The only solution is to temporarily remove the requirement of saving long enough to print the invoice then reapply the setting to ensure all transactions are saved. So there it is, totally legitimate and no fraud involved. Timberly, this may not be of use, but note that with the CCRQInvoice add-on product you can reprint older orders using any template in it’s system, without having to use the password or worrying about the setting of this preference. The issue is, however, that you have to create your templates in this program, which takes more work. It doesn’t use the QuickBooks templates. Feel free to contact me directly if you would like to hear more about this. My husband I own a small business and I don’t believe we are sinister or trying to commit fraud by not having our invoices auto-saved. We are Mac users and Intuit has made an obvious oversight by not including the option to turn off the auto save feature in preferences. They offer it for PC’s. For our business I have custom forms I have made up when we receive orders from our clients. There are invoices which I enter first. Then when we are ready to deliver our goods I need to print up an Order Confirmation with Shipment Date. Then right before we ship I need to print up packing slips. When I go back to orig. invoice and switch template to the Order Confirmation and I click to print or email that CURRENT OPEN template is SAVED and my orig. invoice is overridden by the Order Confirmation template. To avoid this I have to go in and make a DUPLICATE of the orig. invoice then choose my order confirmation template, print or email it and then go back and delete this duplicate invoice in order to save the orig. invoice. This double and triple workflow is very frustrating. I have to do this all over again to print up a packing slip. This is not right and Intuit needs to fix the obvious glitch. I’m currently using QB 2012 and I’m wondering if it is capable of reflecting PAID on the face of invoice (pdf) because in the system one an invoice is paid if reflects a PAID on top but when I exported the invoice to pdf the PAID annotation is gone. You could create a modified template for the invoice that adds a “paid” notation werever you want, and change to that template when you save to PDF. Priscilla here from my July 22, 2012 comment. I guess you didn’t have any input to offer for our problems with 2012 Quickbooks for Mac. If we are all performing “fraud” in not wanting to auto-save all transactions then tell me why PC’s have this option and not Mac users? why didn’t Intuit make it across-the-board so-called “fix” for ALL computers? I have presented the same question to Intuit without any response. Priscilla, I can’t explain why Intuit does something (or doesn’t do something) – their development process continually amazes and confuses me. The Mac version and the PC version are very different products, with different code bases, so very often there are major differences between the products.I never try to use “logic” when thinking about their decision process. I work as a bookkeeper for a small env consulting firm. I print out billing estimates for all the PM’s so they can be sure everything was entered correctly or if they need to move things around to comply with state budgets etc since many funds/ payments come from state coffers set up here in NH for oil spills etc. I turned off the save feature so I can go back and create an invoice after editing by the PM’s. I am sure there are those dishonest people out there but they can always just delete the invoice anyway regardless of a save feature upon printing, so I think that it is a mute point in regard to honesty. There are many reason explained here why this feature should NOT be a requirement. I am just glad it is an option. Thanks! Ah, but a deleted invoice shows in the audit trail, so you can see that this was done. AN invoice that was printed but not saved will NOT show in the audit trail.